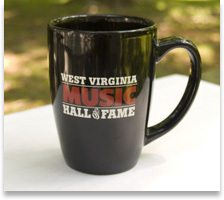 Our handsome black oversized mug bears the Hall of Fame logo on both sides, proudly declaring your support of West Virginia music. It's perfect for your favorite hot or cold beverage and it's dishwasher safe. Hang up your child’s artwork or your grocery list in style. 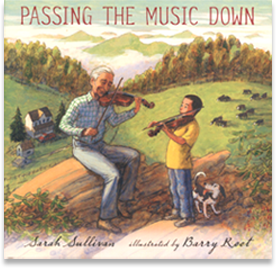 Author Sarah Sullivan’s new picture book, Passing the Music Down, tells the story of a friendship between an old fiddle player and a young boy, and the timeless tradition of passing down music and life experience, and coming of age. The story is based on the real-life friendship of master old time fiddler Melvin Wine and young protégé Jake Krack. 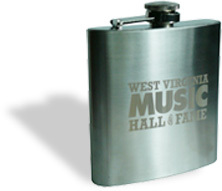 Wine, a Braxton County native who died in 2003, was the recipient of the first Vandalia Awrad. He was also awarded the National Endowment for the Arts’ prestigious National Heritage Fellowship in 1991. Krack is now an award-winning fiddler in his own right. In her book, lushly illustrated by Pennsylvania artist Barry Root, Sullivan’s description of the first meeting between the old man and the boy is a faithful retelling of Melvin and Jake’s first encounter at the annual Appalachian String Band Festival in Clifftop, Fayette County. From there, Sullivan presents the young boy’s transformation into a man, and the range of knowledge that he gleans from his mentor. Passing the Music Down is available through indiebound.com, barnesandnoble.com, amazon.com and sarahsullivanbooks.com.